- aka binary name, binominal name, informally as scientific name, and very informally as Latin name. Scientist or not, we see these names everywhere, these italicized words that most all of us guess the pronunciation. Carcharodon charcharias is the scientific name, or binomen, of the great white shark, where "great white shark" is the common name; and actually, great white shark is only one of this fish's common names, as the species also has the common names of great white, white death, white pointer, white shark, and numerous others. Quite often a single species of fish has many common names within many different languages. How is the common name written? The common name is usually not capitalized. So writing "Great White Shark" is technically incorrect; however, depending on the author and locality of the usage in a publication, you may see the common name capitalized (more oft then not for stylization and formatting). Great white shark, used at the beginning of a sentence, should be capitalized. Do note, if there is a proper noun within the common name, then that word should be capitalized. Such as the Atlantic cod, Gadus morhua, because the Atlantic Ocean, about which the fish is named for, is a proper noun. Who regulates scientific names for fishes? Scientific names in zoology, and taxonomic naming in general for zoology, are regulated by the International Commission of Zoological Nomenclature (ICZN). Since ichthyology (the biology of fishes) falls within zoology (the biology of animals), the ICZN is the foremost global authority for ensuring fair claims and succinctness of zoological nomenclature for any and all fishes. However, the taxonomic authority within ichthyology, and the engine that assures agreement within taxonomic classifications for fishes is represented by Eschmeyer, Fricke, and van der Laan's Catalog of Fishes from the California Academy of Sciences. Why do we need organizations regulating zoological nomenclature, or the naming of species? Good question. To briefly answer, I will mention again that the great white shark has MANY common names within many different languages. These sharks live and travel in an immense amount of territory, swimming in waters alongside almost every country, except in the colder waters in the Antarctic and Arctic. Hence, it is imperative to have a single, recognizable name that all peoples in all countries can utilize. This universal standard eases scientific collaborations and research. It also eases intergovernmental discussions about methods for conservation and regulation. What are synonyms for species? And who has authority on a name? Often you will see many scientific names listed for a single species known as synonyms. Synonyms are other scientific names (besides the official scientific name) that scientists, professors, researchers, etc. used in a published work to explain the same species. There are many reasons for the existence of synonyms; one example is that of the need to rename a species due to new developments in systematics. Such as with the great white shark, as it was first described by Carl Linnaeus as Squalus carcharias in 1758. However, eventually in the following century, after more discoveries and careful considerations, it was decided that the genus Squalus was to be reserved for sharks of different morphological features (even into an entirely different order.) 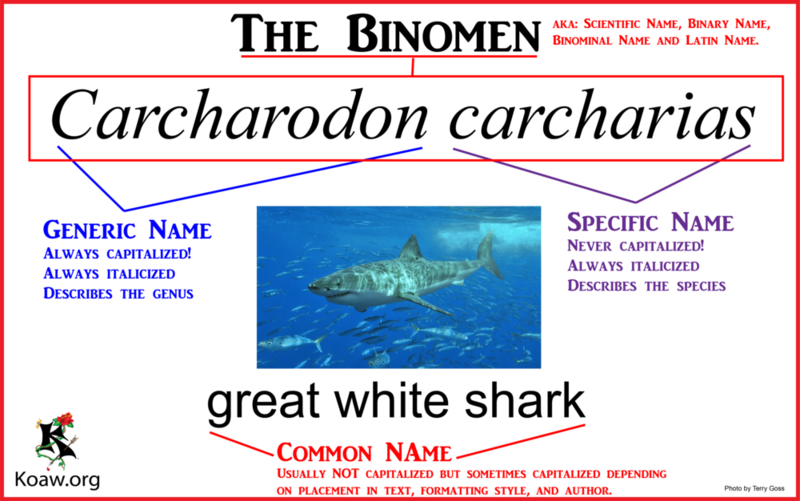 Sir Andrew Smith allotted Carcharodon as the new generic name, keeping Linnaeus' carcharias, leaving us now with Carcharodon carcharias. An important rule set forth by the ICZN is the Principle of Priority, in that, whoever was first to correctly identify and name the species has permanent rights to keep that name intact and that person remains the authority on that name; (just as Linnaeus remains the authority on the great white shark). There are many caveats, or deal breakers, associated with these naming rights and the ICZN website has a lengthy, informative read on the protocols. The authority on a species is often listed after the scientific name, such as is written below where we see "Linnaeus, 1758"; this means that in the year 1758, Carl Linnaeus was first to sufficiently describe the species in an adequate publication. Is a Latin name a scientific name? Yes, Latin name, scientific name, binary name, binominal name and binomen are all synonymous. But, Latin name is a tad misleading. Even though scientific names follow Latin grammatical rules, they are actually composed of many separate languages. For fishes, Greek derivatives are very, very common. Such as the genus Hippocampus of seahorses. This is a construct of hippos, meaning 'horses' from Greek, and kampos, meaning 'sea monster'. And with the great white shark, Carcharodon carcharias, the Greek words karcharos, meaning 'jagged', and odous, meaning 'tooth' form the scientific name. What are the parts of the scientific name, or the binomen? The first part of the binomen is known as the generic name and it describes the genus. This will always be capitalized and italicized. The second part of the binomen is known as the specific name and it describes the species. This will never be capitalized. Like the generic name, it will always be italicized. Do trinomens exist? If so, what is a trinomen? Yes, trinomens are real, aka trinominal name or ternary name. 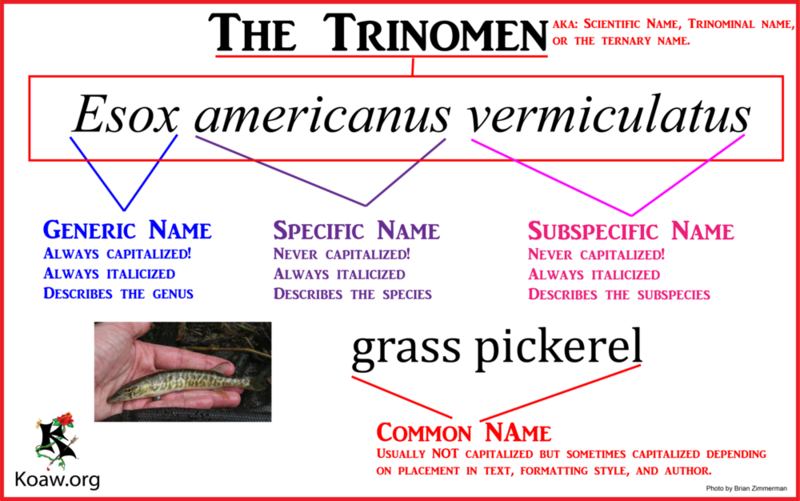 The trinomen refers to the subspecies. For example, Esox americanus vermiculatus is a trinomen for the grass pickerel and it is a three part name, where like the binomen, the first two parts, Esox americanus, describe the generic name and specific name respectively, and the last part, vermiculatus, describes the subspecies, or the subspecific name.